WASHINGTON (CNN) -- Vice President Joe Biden continued the administration's rollout of the recently passed economic stimulus package Friday, highlighting $1.3 billion in federal funding for Amtrak. Vice President Joe Biden called Amtrak "an absolute national treasure and necessity." The money for the rail service, which carried almost 29 million passengers in the previous fiscal year, will go primarily to infrastructure repair and improvement. The $787 billion stimulus plan includes a total of $8 billion for improvements in rail service, a crucial investment to help ease traffic in the congested northeast corridor running from Boston, Massachusetts to Washington, Biden argued. 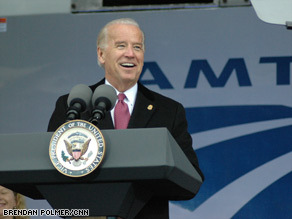 It is "a necessity for a great nation to have a great [rail] passenger system," Biden said. "I'm tired of apologizing for help for Amtrak. ... It's an absolute national treasure and necessity." The $1.3 billion will roughly double the size of Amtrak's capital investment program over the next two years, according to the vice president's office. The largest single project funded by the stimulus money is the $105 million replacement of a movable bridge over Connecticut's Niantic River. The replacement of the 102-year-old drawbridge has been delayed for more than 20 years because of a lack of capital, Biden noted. Leading Republican critics of Amtrak argue that the money is a poor use of taxpayer dollars and that the often-struggling rail service should instead be stripped of public money in an effort to force changes that would make it more profitable. Amtrak is "poorly run and poorly managed," Sen. Tom Coburn, R-Oklahoma, told CNN's Brianna Keilar on Tuesday. "That doesn't mean we shouldn't have a train service, but we [shouldn't] give additional money and reward incompetency and inefficiency. If that's what the stimulus is about, we're in a whole lot worse trouble." Amtrak's financial struggles are more a result of inadequate public support than managerial incompetence, responded Ross Capon, head of the National Association of Railroad Passengers. "By and large, this organization has survived an incredible amount of low funding [for] years," Capon said. There is very little rail service in states like Oklahoma, "so it might not be surprising that one of Amtrak's fiercest critics comes from a state that, relatively speaking, would not notice it if Amtrak disappeared tomorrow." Biden frequently commuted on Amtrak between Washington and his home near Wilmington, Delaware, during his more than three decades in the Senate. In his remarks Friday, Biden argued that every modern passenger rail service in the world depends on subsidies. He also claimed that U.S. highways and airports are actually subsidized more than the railway system. "So let's get something straight here. Amtrak has not been at the trough. Amtrak has been left out," he said. During the 2008 presidential campaign, President Obama pledged to support a national network of faster passenger trains. He has proposed an additional five-year, $5 billion investment in high-speed rail as part of the administration's suggested fiscal year 2010 budget. Amtrak, according to its Web site, was established by Congress in 1970 "to take over the passenger rail services previously required to be operated by private freight railroad companies in the United States." It functions today as a quasi-public entity that, while able to set its own rates and fares, is subject to strict governmental oversight. An average of more than 78,000 passengers ride Amtrak each day, according the rail's press office.